Source: Swiss-Miss. 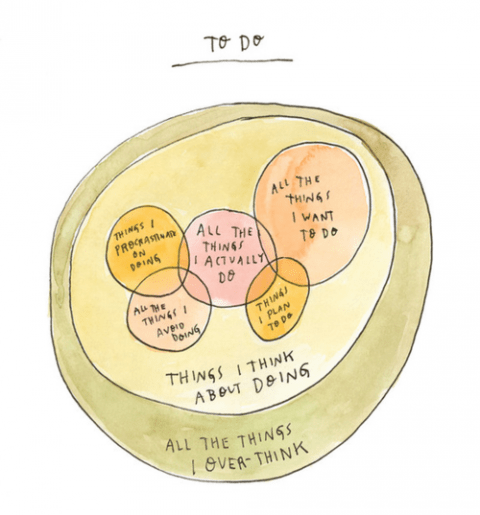 To Do, a new print by Wendy MacNaughton. Sad, but oh so true…. Lol…those circles are me. Have a bunch of list for different things and they are on different sizes of paper with different colors. Crazy part is I redo do them every few days. What a brutal system. At least your system is visually appealing–I have post-it notes stuck to every surface. This is def me today! That’s me every day! I remember all the circles of Stephen Covey….you know, the circle of concern, the circle of control, the circle of influence. I think I now dwell very cozy in the circle of over-thinking…..
Great visual David. I have known Rita Emmett for years. She is the author of The Procrastinator’s Handbook. That is what those circles remind me of – PROCRASTINATION. Thanks Terry. I’ve never heard of Rita but have now. And agree, the circles and motion get me sea-sick too! I think people procrastinate because they are afraid of something. They might not do a good job and don’t want to be criticized. They don’t know how to get started on a new or difficult task. Some people (like me for instance) are just lazy!